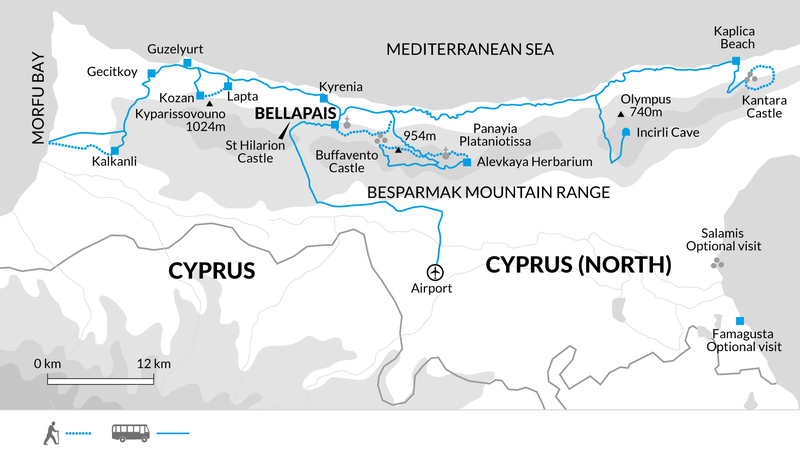 A visit to Northern Cyprus allows you to explore a relatively unknown country that has remained reasonably unspoiled and undeveloped compared to the rest of the Mediterranean. Throughout the trip we use locally owned accommodation and you'll be encouraged to buy local produce and dine each evening in a local restaurant which all helps develop the tourism infrastructure in this emerging destination. Our one week walking trip concentrates on the Besparmak range where we walk through stunning countryside and follow quiet mountain trails leading to imposing Crusader castles. The tour leaders are from the region and this local knowledge assists in giving a historical and personal angle on the areas you will travel through. The group size, at 16, has been specifically chosen to give a personal viewpoint and minimise the impact on the environment, as well as being able to use the locally owned accommodation that is generally smaller than the large chain of hotels. The Bellapais Monastery Village Hotel tries to minimise its impact on the environment by encouraging guests to use less water and towels, as well as purchasing local food from the many markets of the area. The local staff are always on hand to advise on the best local restaurant to dine in or bar to sip a cold beer! The day excursions; walking and visit to Famagusta. Try to avoid long wait on outbound journey at Istanbul.